How fast is the Nikon 850 electronic shutter? You are here: Home / D850 / How fast is the Nikon 850 electronic shutter? This is the first post in a series about the Nikon D850. The best way to navigate to the other posts is go to the widget on the right (you may have to scroll down a bit) labeled “Category List”. It has a drop-down menu that has a category called “D850”. If you pick that from the list, you’ll be taken to a set of pages with links to each post in the series. Alternatively, you can scroll down to the bottom of this page — below the comments — and find the pingbacks whose titles interest you. If you click on them, you’ll link to those posts. Sorry about the post drought for the last couple of weeks. I’ve been working with Jack Hogan on understanding the practical relationships between camera spectral sensitivity and developed color accuracy. It’s been pretty arcane stuff, which is why I haven’t been testing your patience with it. But I’m going to take a little break from that because yesterday I got a Nikon D850 to test. I know I’m late to the D850 party, so I’m not going to do a complete test. It’s pretty obvious that it’s quite a camera. I have some issues with the design goals, which I’ll get into in a later post, but it’s clearly what many of Nikon’s customers want. The D850 has a silent shutter mode — actually, it has two. When running silent, the mechanical shutter is open and the sensor does all the work. 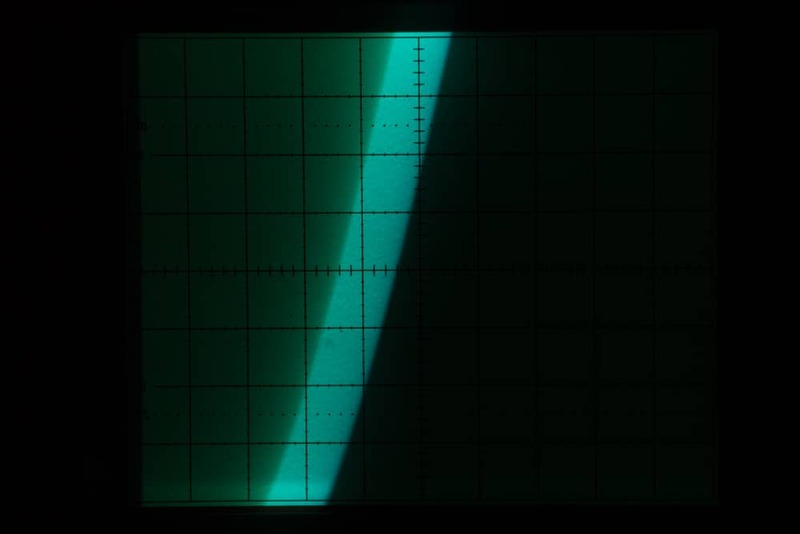 The mechanical shutter is a rabbit, completing an exposure in faster than 1/250 second (for shutter speeds much faster than that, a slit moves across the sensor, and we’ll see in this post how long it takes to make its journey). The fully electronic shutter takes longer to do its job. 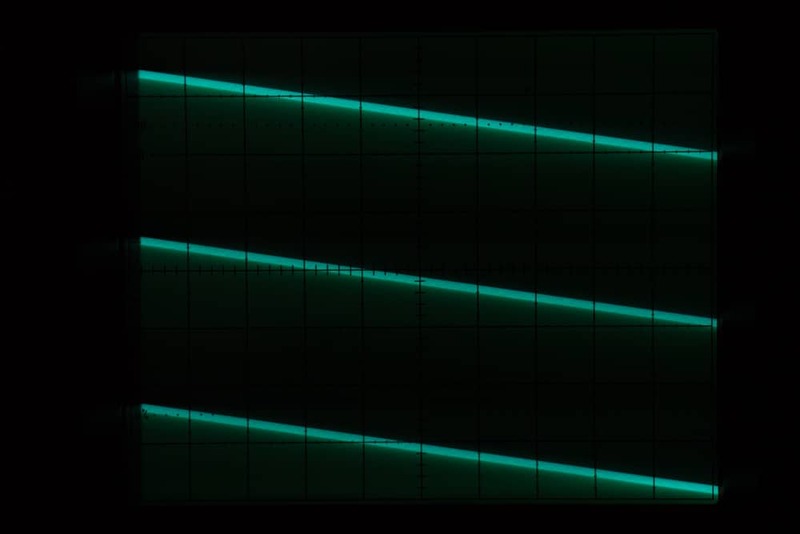 I set up an analog oscilloscope with an input from a function generator. If you’re going to try this at home, don’t try it with a digital scope; it won’t work. I set the time base to 1 msec/division, and the amplitude of the generator to just over the maximum excursion for the scope’s vertical sensitivity. I mounted a 120mm f/2.5 Voigtlander macro lens on the D850. I put the RRS plate on the camera and clipped it into an Arca Swiss C1 head on a Gitzo tripod. I set the camera for mechanical shutter, with silent shutter off. I set the camera to manual exposure, and the shutter speed to 1/1000 second – that’s one msec. The mechanical shutter on the D850 travels from the bottom of the image to the top. Looking at that another way, it travels from the top of the camera to the bottom. The speed is not constant; if it were the diagonal green band would have straight edges. 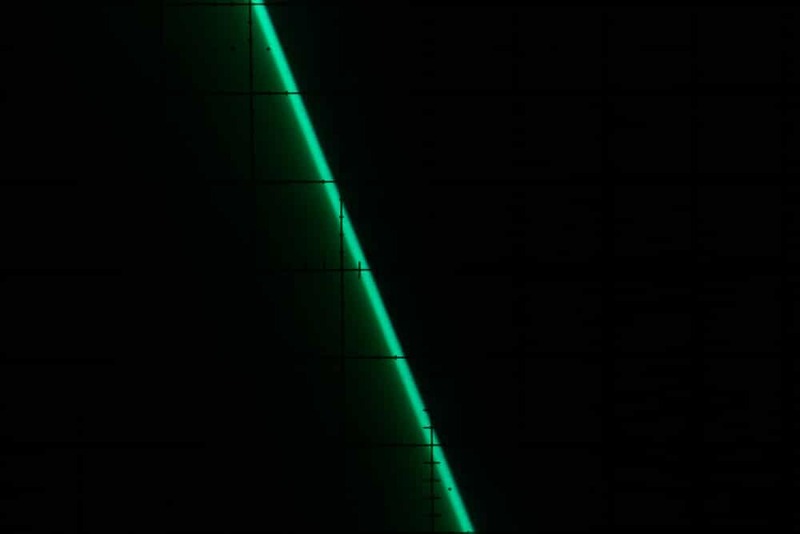 The shutter accelerates as it moves across the sensor. Both curtains accelerate at about the same rate, so that the exposure — the horizontal width of the green stripe — is about the same from the bottom to the top of the image. The width of the stripe is one division, or one millisecond. You will recall that I set the shutter speed for 1/1000 second. 1/1000 second is one millisecond. It’s nice when things work out the way they’re supposed to. Now I’ll add some construction marks so that we can figure out how rapidly the mechanical shutter takes to get from the bottom of the image to the top. 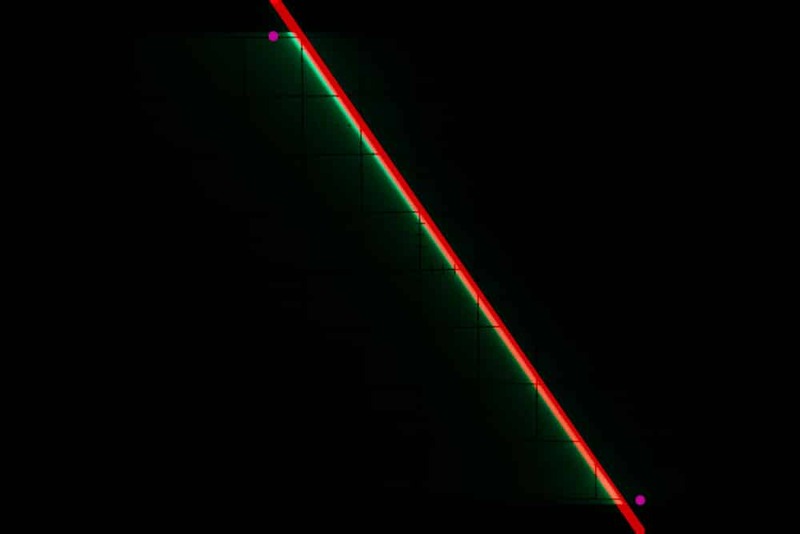 The red line approximates the path of the trailing curtain. The magenta dots are projections of where the red line intersects the top and the bottom of the frame onto the top and bottom of the oscilloscope graticule, and the horizontal distance in divisions between those dots will give us the shutter travel time. I put it at 2.4 divisions, or 2.4 milliseconds. That’s about 1/400 of a second, and is fast as mechanical shutters go. I put the distance between the magenta dots at 6.4 divisions, or 64 milliseconds. That’s about 1/15 of a second, or about the same speed as the a7RII silent shutter. Switching to Mode 2 gets us a cropped image. The Mode 1 image is 8256×5504 pixels, and the Mode 2 one is 3600×2400. The exposure time is shorter: about 2.4 msec, or 1/40 second. Thanks for this. I assume being that slow it hasn’t chopped a few bits off the ADC and the noise levels should be the same. I also notice that Dpreview didn’t even mention this is their review. As far as I know its the first DSLR to offer this (if you discount Pentax pixel shift which must be using one).